Keith Jadlowski (left), Brett Smith and Jake Jadlowski show off a stringer of walleye at Lake McConaughy. Like most of us, I’ve fished for all kinds of fish in a whole bunch of different places. But regardless of species and location, most of the fishing I’ve done has been centered around my rod, my lure and me. Whether I’m flipping jigs for largemouth bass or bottom bouncing for walleye, most of my success or my failure is mine alone. Like golf, there is no guarantee that two guys using the same ball and driver will hit a tee shot that lands in the middle of the fairway. Likewise, there is no guarantee that two guys in the same boat, using the same lure and tactics, will catch the same amount of fish. I truly enjoy this individual element of fishing. But I’ve also learned that there is a lot of fun to be had while fishing as a part of a team, and trolling crankbaits for walleye is the ultimate team sport. It takes a team to manage the chaos of running multiple lines, attaching planer boards, changing out lures, fixing giant tangles, switching motors, controlling the boat, fighting the fish, netting the fish, getting the boat back on course and redeploying all the lines. Success is shared, and it requires the contribution of everyone on board. When trolling crankbaits for walleyes, it doesn’t matter if you reeled it in. It feels like every fish is your fish, and it’s a blast. Unfortunately, failure is also shared. And my team did a lot of that before we got smart and upgraded our equipment and developed a system that was efficient enough to occasionally fill up the livewell. Our first attempts at trolling resulted from a slow bottom-bouncing bite as we tried to cover more water in order to locate fish. This was fun. We found that the bite could be fast and furious. However, as we increased the amount of time we spent trolling, we quickly learned that our system was not good. Hand rods resulted in varying rod tip locations that altered the depth of our lures. There was no way to know how much line we had out. And even if we did, we didn’t know how much line to let out to achieve a desired depth. And even if we did, we had no idea how much to let out to get a specific lure to run at the depth we wanted. In short, we didn’t know what we were doing and even when we did catch fish, we didn’t know how to repeat it. All good lessons are learned by errors. As we messed it up, we got smarter. So to keep you from making these same mistakes, here are a handful of essentials for anyone interested in getting out their box of crankbaits and teaming up with some buddies. In addition to being able to maintain and control your rod tip, these allow you to run more than one rod and they keep your hands free so that you can help a buddy get untangled or land a fish. Rod holders maintain and control more than one rod when trolling while also allowing anglers a hands-free option. Photo by Jake Jadlowski. Line Counters – Getting crankbaits to the target depth is a huge part of finding success while trolling. The depth that a given crankbait can run depends on the amount of line that you let out. The best way to consistently keep the lure in the target zone is to know exactly how much line has come off your spool. Swapping out a baitcasting reel for a line counting reel is a must. Precision Trolling App – Line counters are awesome, but they don’t tell you the whole story. They simply tell you how much line has come off the spool. They don’t tell you how much line to let out to get a certain crankbait to run at the depth that you want. They don’t tell you how to adjust that number when you change to a different type of crankbait. And they don’t tell you how the particular brand of line, type of line, and pound test line on your spool alters the depth that a crankbait will run. But you can tap modern technology to keep track of all this. With the new Precision Trolling app you simply enter the line that you are using, the crankbait that you have tied on, and the depth that you want to achieve, and the app instantly tells you how much line to let out. Buy it in the App Store. Quick Clips – Once you are armed with a line counter and the app, you’ve unlocked the mystery of your crankbait box. Tie on as many as you need to until the fish tell you want they want. Better yet, tie on a quick clip once and snap on cranks as fast as your heart desires. Lastly, don’t forget your camera. In the event that you figure out the right depth, the right speed, and the right crankbait, you’re going to have a pretty cool photo opportunity. In fact, you may never want to tee it up by yourself again. ? Before deploying or re-deploying your lines, make sure your crankbait is running true in order to prevent tangles and to ensure that your lure gets down into the strike zone. Don’t be afraid to experiment with different crankbait types, sizes and colors. Eventually, the fish will tell you what they want. Just because state fishing regulations may allow you to use more than one rod doesn’t mean you have to. Keep it simple until you figure out a system that works. Crankbaits are manufactured to create irresistible action under the water. But don’t shy away from an occasional jerk of the rod tip to vary the action and give your lure some extra life. Maintaining a trolling speed between 2 and 3 mph is a pretty good rule of thumb. But feel free to experiment with slight speed adjustments or abrupt changes in speed to entice strikes. Just because a given crankbait is capable of reaching a maximum depth doesn’t mean the fish are at that maximum depth. Experiment with different depths within the water column to create strikes. 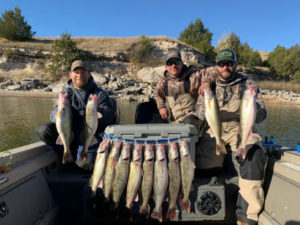 This entry was posted in How To Fish, Walleye and Sauger on April 11, 2019 by ronniegarrison.